March 2014 - Attached is a booklet containing articles on Alternative Dispute Resolution from various jurisdictions. At a meeting of the Consumer Protection Working Party which took place at the AIDA Europe Conference in Amsterdam on 26 May 2011, Ana Keglevic from the University of Zagreb, Croatia and the AIDA Europe Student Prize winner for 2011, presented a paper " Pre-contractual information duties in insurance contract law - European Regulation, Comparison of Laws and Challenges for Croatia". Attached is a copy of her paper. A meeting of the Consumer Protection and Dispute Resolution Working Party was held jointly with the Distribution of Insurance Products Working Party, at the AIDA Presidential Council meeting in Tel Aviv on Thursday 8 September 2011. The topic was "Special obligations and liabilities of the different types of insurance intermediaries. The borderline between the obligations and liabilities of insurers and those of insurance intermediaries towards consumers". Attached is a copy of the Agenda and the Minutes. Also attached is a powerpoint presentation by the Chairman of the working party, Professor Samim Unan. A meeting of the Consumer Protection and Dispute Resolution Working Party took place on 8 May 2013 at the Calouste Gulbenkian Foundation in Lisbon on the occasion of the CILA (Iberian Latin American Insurance Law) Congress. Attached is the Agenda and a booklet containing the papers submitted to the meeting. The Consumer Protection and Dispute Resolution Working Party met on 18 September 2013 at the AILA National Conference in Sydney. Attached are the Minutes from that meeting. A meeting of the Consumer Protection and Dispute Resolution Working Party took place on 8 May 2014 at the AIDA Greek Chapter (HILA) Summit in Athens. Attached is an e-booklet containing the papers from the session. Nic De Maesschalk, BIPAR, Brussels "IDD and Bancassurance: identification of potential issues". 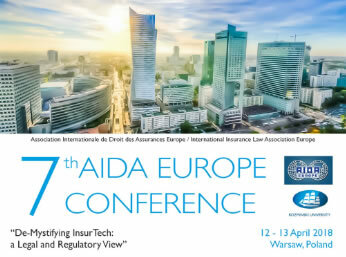 The Working Parties on Distribution of Insurance Products - chaired by Prof. Pierpaolo Marano and the WP on General Principles of Insurance Law – chaired by Dr.Kyriaki Noussia met jointly in Warsaw at the 7th AIDA Europe conference at Sessions 3,4 on 13/4/2018. The sessions were jointly chaired by Prof. Pierpaolo Marano & Dr. Kyriaki Noussia. In Session 3 titled "Issues arising from the implementation of the IDD" the following presenters and papers were delivered: a) Nic de Maesschalck presented on "IDD - State of Affairs", b) Arthur Hilliard presented on "Issues Arising from the Implementation of the IDD", c) Leo P Martinez presented on “Customer/Policyholder Protection Viewed against the NAIC Model Acts”. In Session 4, titled "Challenges to the IDD from new technologies" the following presenters and papers were delivered: a) Mr Bruno Caeiro presented on "Pre-Contractual Duties of Information in light of the IDD", b) Ms Ines Oliveira Martins presented on "Personal Data, any other data and the insurance contract and the connection with the IDD", c) Prof Dr Margarida Lima Rego presented on "Insurance in today's sharing economy: a contract law analysis - the IDD impact" and d) Prof Kuan-Chun Johnny Chang presented on "Privacy Issues Associated with Telematics and Usage-Based Insurance and Compliance Issues under IDD and data Protection Directive"
The Working Parties on Distribution of Insurance Products - chaired by Prof. Pierpaolo Marano and the WP on General Principles of Insurance Law – chaired by Dr.Kyriaki Noussia met jointly in Rio de Janeiro on 13 October 2018 at the time of the World Congress. Attached are the Minutes of that meeting.